Previously I use to have a little problem finding out all the pre-installed softwares on a system. Is either I have to check it out manually or asking the user or my client the softwares installed on the system. Ignorant was actually bad; and I bet I was wallowing in my own ignorant. Do you know you can actually use a simple batch file programming script to source out the whole softwares pre-installed on any system within the next few seconds? This was not possible with me till it became possible via the implementation of a batch file programming script. Batch files are series of ODS command written to perform a specific function(s). For some time now I have been writing several batch file programmes. I have written batch file programmes for networking, batch file scripts to perform a simple system maintenance and a whole lot of them which I may not be able to mention. Batch file programming like I said, is very important. Apart from the fact that it makes work easier for you, all your computer jobs can be done via the use of automated procedures with the aid of batch files. Now imagine implementing automated tasks to carry out simple system maintenance such as system defrag, disc clean up, Spyware check, disc checker and a host of other tasks. This will be nice considering the fact that one could be less busy which could cause ignoring these task, forgetting the fact that they may need these functions to be carried out on there systems in other to keep them in a good working condition. For you to check the installed software’s on your system, you will need to run the batch file programme that I am going to share with you. 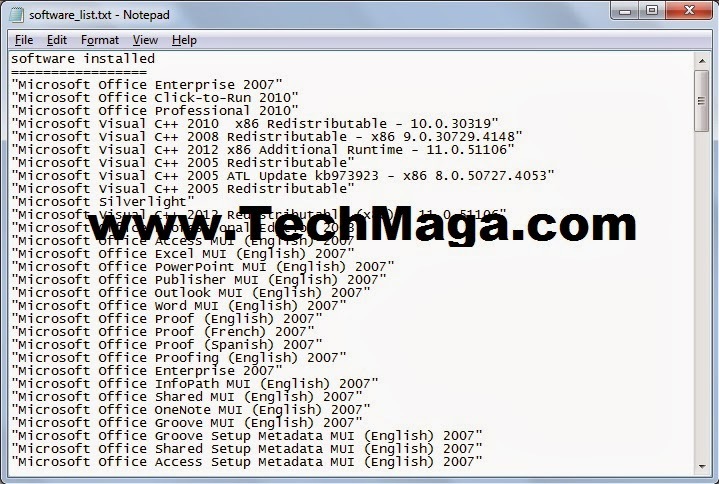 This batch file programme has been tested, confirmed working and completely trusted. All you need is to run it with an administrator privilege on your system and it automatically creates a notepad on your desktop containing a list of all the pre-installed software’s on your system. Download the already prepared Batch File Script To Check All Pre-InstalledSoftware’s On Your System or you can copy and paste the script below in a notepad. Please note that I rely on your testimony to improve on the quality of this post and that is why your comments are greatly appreciated so far. Feel free to learn more about the script. It is in a .bat extension format. You can edit the program-me to view source codes. Awesome tutorial I guess and I'd checking the tutorial on my own now. Batch file programming is something i enjoy doing. Though i have not been around for some time now.Thanks for stopping by.